Mission critical applications require commercial-level maintenance. ActiveState helps you maintain your mission critical applications throughout their life-cycle. 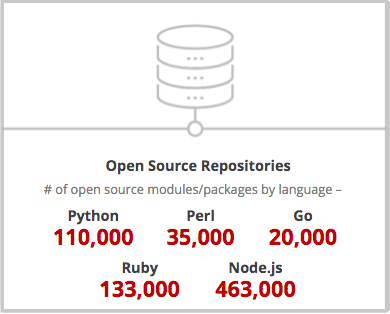 Tens of thousands of open source developers create, update and maintain hundreds of thousands of packages and modules. And the numbers are growing. More open source software makes every developer’s job easier. But it also creates constant updates and changes to the code you rely on. Careful vetting of open source suppliers to ensure only well-supported and well-maintained packages & modules are included. Timely security patches and fixes, released as required. ActiveState keeps your code active. Our quarterly releases help you plan for your upgrade and help you maintain your open source language version. New functionality in the form of new packages and modules created by the open source community – all checked for license compliance, vulnerabilities and dependency conflicts. New versions of existing packages and modules. Open source usage is up, and support needs to catch up. In just over 10 years, using open source software went from being too risky to being the norm in enterprise applications. Urgency: You can’t count on getting an answer to an issue from open source creators in time to make your deadline. Confidentiality: Posting your issues on public forums may get you a timely answer. But your issues are then broadcast to competitors and bad actors who might be able to exploit those issues. We have hundreds of thousands of hours of combined experience supporting enterprises just like yours. We’ve been doing it for over 20 years. No one knows open source runtime challenges like ActiveState. We’re also founding members of the Python Software Foundation and contributing members to the Perl Foundation, Tcl and other open source communities. ActiveState has the insider expertise that can help you resolve everything from highly unusual issues with older versions to conflicts with your environment. Depending on which license you choose, you can get unlimited support with guaranteed SLAs. Understand when and how best to upgrade from legacy to recent versions, or else migrate from an older generation of a language to the newest generation. Have applications written a decade ago, running on platforms that are no longer supported? ActiveState can provide you with the production-level support you need. For more information on ActiveState’s licensing options, check our pricing chart.